One of my favourite things about writing about Linux is when I decide to review one of the smaller distributions. This week I have had the pleasure of installing, exploring and now reviewing Emmabuntus 2.
easier, more accessible and lighter. 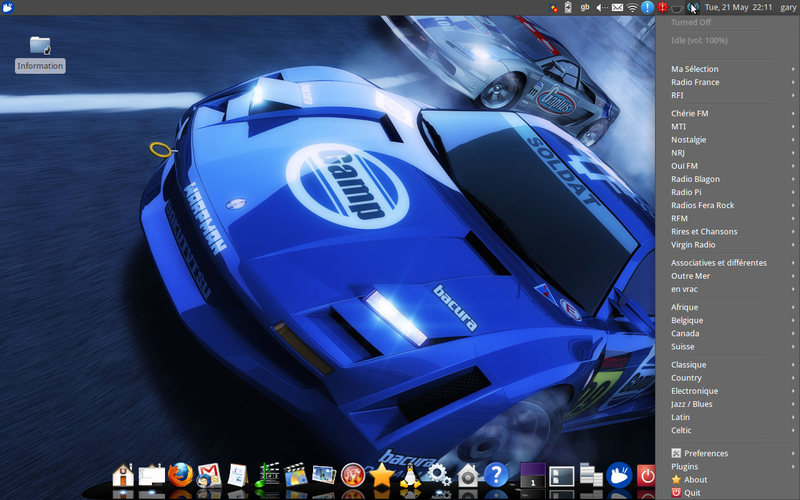 So from reading the WIKI what I have understood is that Emmabuntus is based on Xubuntu 12.04, contains a lot of software and it is easy to setup and navigate. Read on to find out if this is true or not. Before I start with the review properly I wanted to draw your attention to the WIKI page for Emmabuntus because it is one of the most informative that I have seen. The WIKI page clearly sets out intentions of the project, has hardware requirements, links to the download and installation instructions. This should be your first port of call. Don’t worry if you ignore this advice though because once you have installed Emmabuntus there is an information folder on the desktop which gives you a second chance to get at the WIKI. This is a 3 GB + download. Normally I use Unetbootin to burn the distribution to a USB drive and boot into the live session before installing to the hard drive. As the download was over 3 GB I decided to burn the distribution to a DVD. 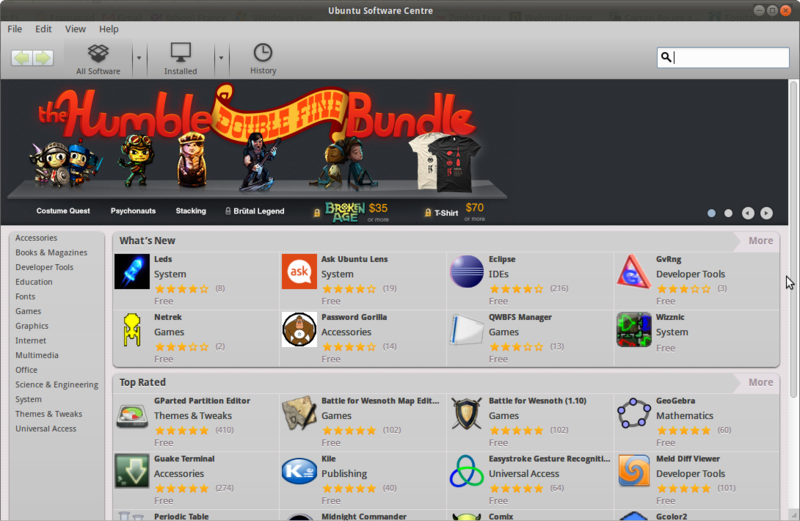 Emmabuntus is based on Xubuntu and therefore the installer is a customised version of the Xubuntu installer. Choose your locale, choose whether to install alongside another operating system or use the whole drive (or custom) and create a user and password. All very standard stuff. It takes a while to install Emmabuntus but it is easy to see why when you run it for the first time. When you boot Emmabuntus for the first time you are asked to choose what you want to appear on the dock at the bottom of the screen. There are 3 options available. I decided to opt for the “All” option and the result is a mass of icons at the bottom of the screen. At this point I was prompted to enter the root password again (unfortunately there was no message to say why which is a bit offputting). This is where I came across a small issue. When I entered my root password I was denied access. The reason I was denied access was that my keyboard was set up to be French. (Emmabuntus is a French distribution so that isn’t so shocking I guess). I had to cancel the request for a root user and change the keyboard layout to English. At this point I had no idea what the reason was for entering the root password. Rather fortunately I decided to go to bed at this point and I shut down the computer. When I rebooted the next day all became clear as I was again asked to enter the root password and now because I was using a UK keyboard layout my root password was accepted. A series of questions pop up. The first message box provides a link to a donation page and a petition. The second question asks whether you want to install the proprietary stuff such as Flash, MP3 codecs and fonts. The next message asks whether you want to remove the languages that you do not need. I can’t help but feel it would be better to change the installer to install the languages you want in the first place and then they don’t need to be removed after the event. This would also remove the keyboard layout issue when the distribution is first started. 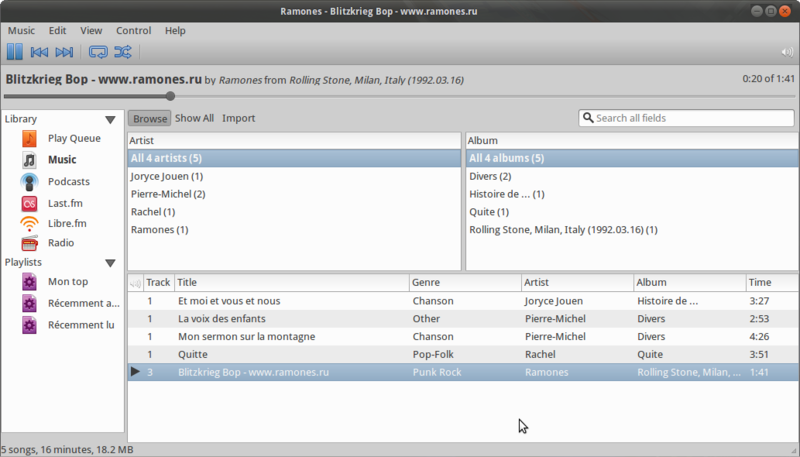 Emmabuntus is by and large Xubuntu 12.04 with the bells and whistles added. Remember the aim of the project is to provide a fully featured operating system with a wide range of software available but also light. Emmabuntus has attempted to enhance upon the Xubuntu system by using the CAIRO dock at the bottom instead of the stock XFCE panel. 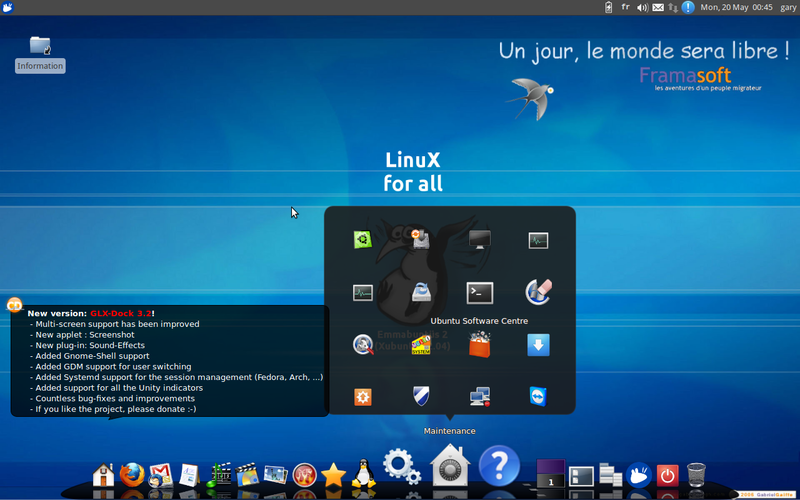 The panel at the top is the standard XFCE panel with a menu icon in the top left corner and in the top right icons for the battery, language, audio, messages, networks, notifications and the clock. The CAIRO dock at the bottom in my case shows a whole host of icons because I chose the “all” option. If I chose the “kids” option or the “simple” option then a smaller subset of icons would have been shown. The CAIRO dock shows a home icon, a FireFox icon, a communications category icon, an office category icon, audio category icon, video category icon, photo category icon, disk burning category, interests category icon, education category icon, utilities icon and maintenance icon. There are also icons for changing workspaces, the trash can, shortcuts and power. Clicking on a category brings up a speech bubble view with a list of applications that belong in the category. The dock is very stylish but it can get a bit annoying when you accidentally hover over the bottom of the screen whilst trying to navigate to say the bottom of a document in LibreOffice or a the editor within Blogger. The thing that is immediately apparent in Emmabuntus is the sheer number of applications that are installed by default. You might want to skim this bit and move to the next section as it is like the competition section of the Gadget Show where they list over 100 prizes. There are lots of other applications installed that I haven’t listed here but you get the idea. If all that isn’t enough WINE is installed as well so you can run Windows programs as well. If you decide that there aren’t enough applications installed there are two things you should know. The first is that you are probably insane and the second is that software can be installed via the Ubuntu Software Centre. As Emmabuntus is based on Xubuntu connecting to the internet is a breeze. There is a network icon on the panel and clicking it brings up a list of the available networks. All I had to do was enter the security key and I was connected to the internet. A rather interesting feature I stumbled upon was when I tried to go to the Everyday Linux User website. (This site). I was denied access to the website because this site is in an unrated category for the site blocking software. 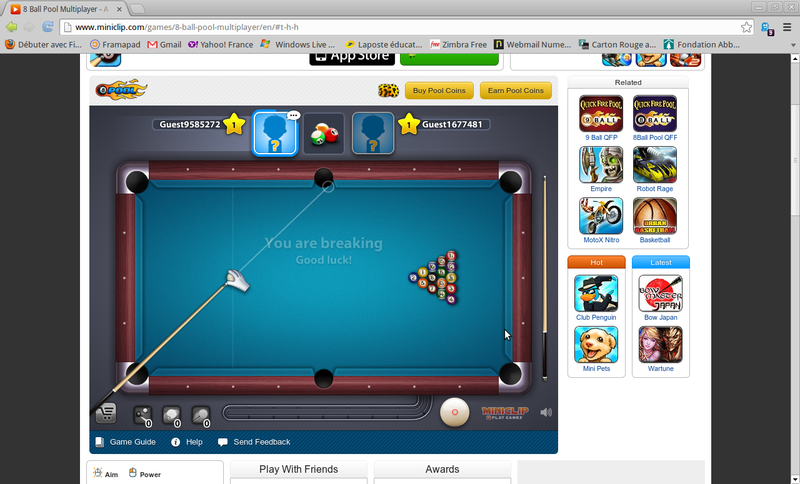 This is an add-in that has been installed in Chromium and FireFox. 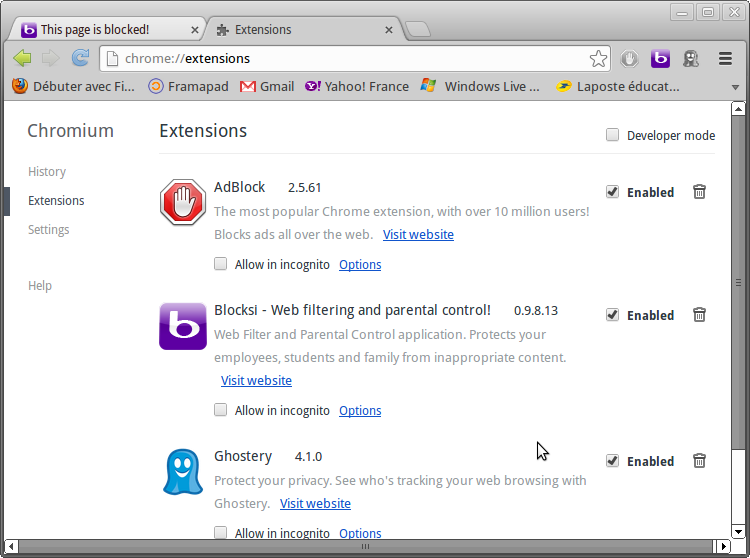 To turn off the add-ons I had to go into the settings for the browser where I also found add-ons for advert blocking and ghostery which helps you find out which sites are tracking your browsing. 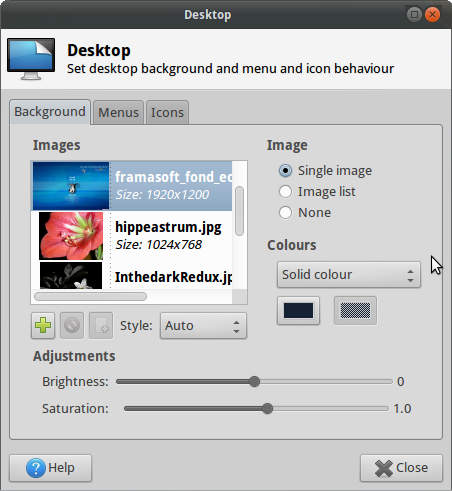 To change the desktop background in Emmabuntus you follow the same process as you would in Xubuntu. Simply right click on the desktop and select desktop settings. There are some desktop wallpapers available but I like to add my own so I added some into my pictures folder and clicked the plus symbol and located the pictures I had downloaded. I always find it amazing how a well crafted wallpaper image brightens up the desktop. The scripts that run when you first install Emmabuntus take care of all your Flash and MP3 needs and as you can see Youtube works perfectly. There are a plethora of music applications installed with Emmabuntus but what surprised me was that when I loaded Rhythmbox there was already some songs installed. I thought this was a nice touch. The music installed however is in OGG format. There were no issues playing the MP3 files. One of the applications in the audio category is called Radiotray. This adds an icon in the top right corner of the screen. When you click on the icon a list of online radio stations appear broken down into various categories. By default the radio stations are mainly French in nature but you can change the preferences to make the list show the radio stations of your choice. 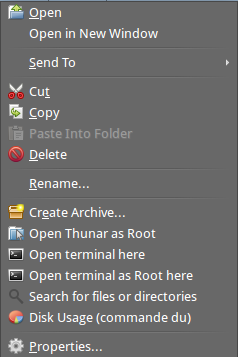 Emmabuntus basically takes Xubuntu and adds to it in an attempt to cut out the configurations steps many people have to go through before using their system. There are a number of ways of creating a distribution and when it comes to the choice of software I see there being 3 approaches. Keep it minimal by only installing the applications necessary to run the operating system. Install a popular set of applications you believe users would like to use. Install a heavy assortment of applications so that users do not have to download anything extra. For me there are merits in each approach. If you keep it minimal then it is up to the user to decide on the software they wish to install. For more experienced users this is easy because they already know what is out there. If you go for option 2 and install a popular set of applications then you are second guessing the applications that people would like to use. This is an acceptable approach because it means the system is useable out of the box and the user can get going straight away and if they prefer other applications they can install them as required. Option 3 seems more scattergun but for new users it is actually a fairly valid thing to do. Disk space is no longer really at a premium and so installing extra software isn’t really a problem unless it loads at startup and uses up memory. If you have never tried Linux before it is probably quite an exciting prospect seeing so many options available. You can try out 2 or 3 of each type of application and decide on the one you wish to use. Emmabuntus has a few quirks. As it is a French distribution there are a few menus and applications that have French headings. The radiotray application is full of French radio stations and there is the issue I raised when running Emmabuntus for the first time where I couldn’t enter a root password because the keyboard layout defaulted to French. Other than the small issues raised I have to say that Emmabuntus was a real pleasure to use for the past week. 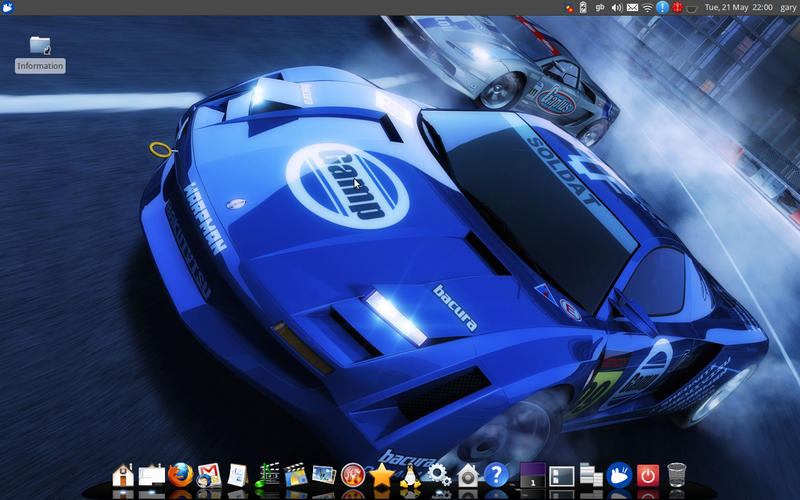 Everything just works and the XFCE desktop keeps things running snappily. 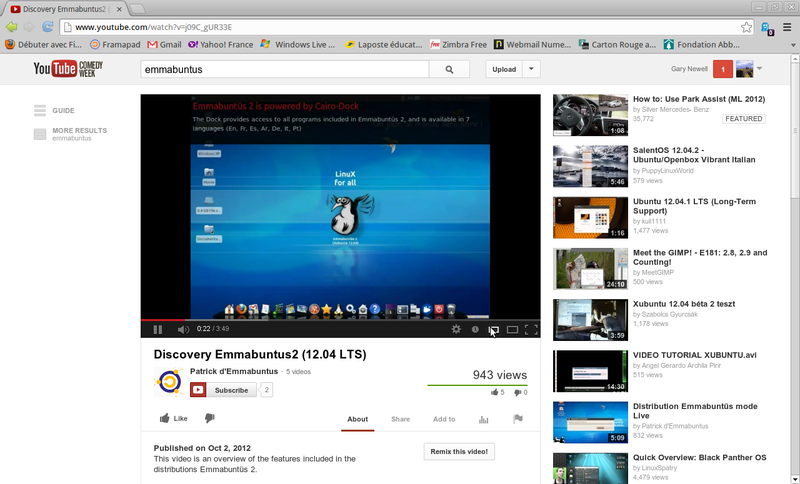 Emmabuntus does really take the Xubuntu 12.04 release and add to it. 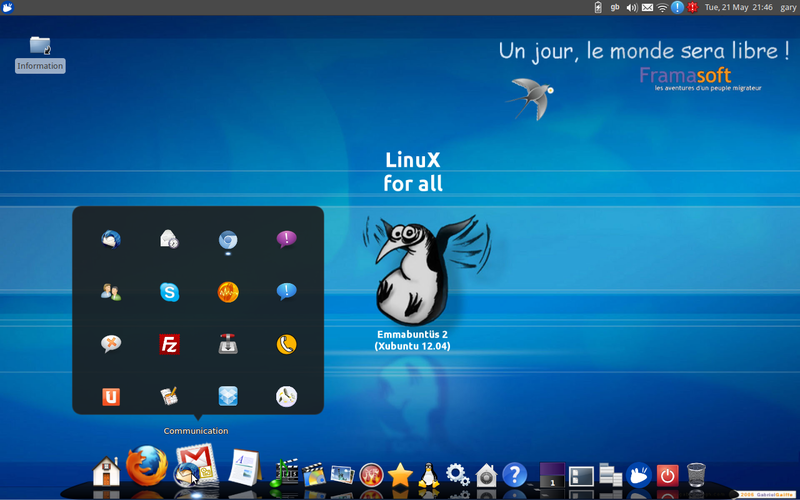 The Cairodock is really nice and it makes it much easier to navigate the system than the standard XFCE panels. I have decided to install Emmabuntus onto my netbook for a while to see how I get on because having downloaded 3.5 GB of software I may as well use it. If you have a computer that is a few years old but not ancient then I would really recommend Emmabuntus. Gary, are French roots still visible in your installation like they were in my take of Emmabuntus 2? Yes there is the odd French title on dialogs and form headers and as mentioned in the review the radio stations are all French. I have a hobby of taking old computers and cleaning and refurbing them up, then passing them on to families that don't have the financial resources to purchase one. this linux platform is, in my opinion, a great choice to use. yes, it's not Windows, but personally I think that Linux is a better answer. Inasmuch as I am retired, this brings pleasure and purpose to my life. May God Bless you and yours. Thank you Emmabuntus_2.